Insidan ▶ News ▶ That weird object? It’s a gavel! ▶ That weird object? It’s a gavel! That weird object? It’s a gavel! One thing is clear – that weird object in the US is a gavel, manufactured by Kanevad in Gamla Linköping. But how it ended up in St. Louis remains a mystery. Inside LiU’s request for information about that weird object in the US has been answered. 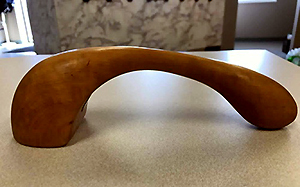 Around 20 current and previous employees have been in touch, and all agree that this is a gavel. And this one is, in fact, not unique. It is rumoured that identical or similar gavels have been used at the Department of Computer and Information Science and at Akademiska föreningen. Further, one is still in use by the University Board. The latter has an inscription, Kanevad -01, and is in the safe hands of the board’s secretary, Jenny Ljung. And this led us to contact Kanevad Träsnideriet in Gamla Linköping where Håkan Jansson, who has worked with traditional craft at Kanevad for nearly 40 years, certainly remembered this type of gavel. He could also remember Vice-Chancellor Anders Flodström being a good customer, and purchasing many different wooden items. Not just traditional gavels, but gavels that symbolised various research areas such as tyres, lightbulbs and computers. Some international students and PhD students also purchased carved wooden items from Kanevad, as souvenirs of their time at Linköping. Maybe it was just such a souvenir that a student took home to St. Louis. We haven’t received any information about how the gavel ended up there, and this part of the mystery remains unsolved. Thanks to everyone who contacted us and, at least partially, helped to solve the mystery!